Wonderful things are happening in our creeks right now. Squirming up through the gravel to greet the spring daylight are needle length silver sided salmon. Some will still have a yolk sac extending from their belly and these are still very shy. Others, however, will have a sleek salmon shape where the yolk sac has receded to make the belly of the fish. These salmon fry are hungry and within moments of having pushed up through the gravel they will be drifted with the current to the tailout of pools. Here the minute biomass of drifting surface material like leaf parts, blossoms, twigs and flying insects becomes the staple foodstuff for their short and long stay in freshwater. Each of the five Pacific salmon species have an unique life story in their fry stage, that period of time when they live in their natal stream. Chum and pink salmon have evolved such that they remain in their natal stream for only a short time, migrating downstream to the ocean almost from the moment they struggle up through the stream bottom gravel. Chinook salmon fry will remain in their natal river for a period of from one month to one year. Sockeye salmon fry migrate upstream from where they hatch to remain in a headwater lake for a period of one year. Coho and steelhead have the most difficult freshwater stay. Coho remain in their natal stream for a period of a year and a half before they migrate downstream to the ocean. Steelhead trout, now classified as a salmon, have fry that remain in their natal or home river for periods of two or three years. Some will remain up to four years although this is rare. I have always enjoyed exploring streams during the spring of the year. I recall a recent trip where, while wading a small tributary creek to reach the main river for some steelhead fishing, I was startled by the sudden swirl of water in front of me. There, only yards away, the upper half of a square spotted tail sliced through the water like a shark fin. When the large steelhead reached the deeper waters in the pool I could still follow a surface "V" wake of water until the fish hid under a jam of logs. May and June are a time when many steelhead spawn. I am certain that I accidentally disturbed a pair on their spawning bed in the clean gravel of this tributary creek. Their 6000 plus eggs will grow quickly as the water temperature increases, and the fry will hatch out in late June or early July. These steelhead fry will just have time to adapt to the conditions in this creek before the summer drought will put a severe check on their growth, such are the water fluctuations of our streams. But, they have evolved for just such conditions and, when the water ceases to flow, they will 'gravel-up' that is, they will burrow deep in the gravel of pools and take on a summer hibernation state. As my partner and I walked downstream beside the creek, we spotted an eagle wing tangled in the branches of a riverside alder tree. The deteriorating wing was at least two meters above the level of the creek, obviously caught there during a winter high water flood. To think that this tiny tributary was a raging river only recently was difficult to conceptualize even though the evidence of branch limbs, snags, and streambank high water mark pointed to the obvious. Then, to realize that during late summer that this same bubbling creek would in most places be a dry streambed was even more difficult to conceive. But, these extremes are reality for our stream salmon. Coho and creeks go together like boys and water. I am certain that at one time all British Columbia creeks and streams with direct access to the Pacific ocean (20,000+) held populations of coho, each unique to the whims of that particular watershed. Unfortunately, habitat destruction has seriously limited the number of creeks and watersheds that still retain coho. 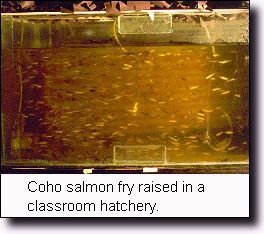 Coho eggs are laid in the late fall then hatch in early spring. 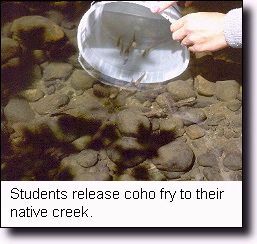 The fry remain in the creek for a year then leave the creek as a smolt during May. Coho live in the ocean for a year and a half and then as 3+ kilo adults they re-enter their home stream in November to spawn. All salmon except steelhead die after spawning and contribute their body materials to the ecosystem. This provides vital nutrients for the health of that watershed. Coho watersheds have extensive networks of tributary creeks which during high November flows often find spawning adults in strange places. These adults will follow the flows of storm drains, ditches and even culverts to reach spawning areas. It is a classic example of their ability to find the greatest variety of nursery waters for their offspring. Coho fry are the easiest of all salmon to identify as they often have white tipped fins and no spots on their dorsal fin like trout. Take a quiet walk along these creeks when the Trilliums, Fawn Lilies, Yellow violets and Dogwoods bloom. Pause at the tailout of pools and look for moving shadows on the creek bed. 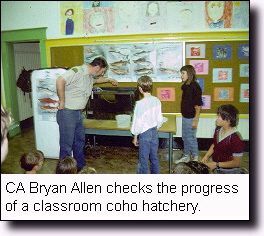 Once a fry is located it becomes easy to identify others and, then, to clearly identify the coho fry. It is a special nature walk that I highly recommend to all, a walk that brings a clear appreciation for the adaptability of these unique fish, our Pacific salmon. What can we do to protect these vital salmon nursery watersheds? 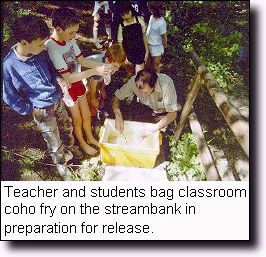 In 1996 Community projects and volunteers working through the Salmonid Enhancement program released over 18,000,000 salmon fry in B.C. watersheds. 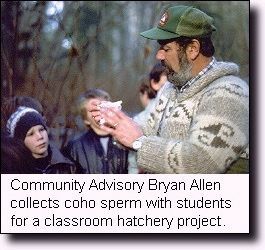 Throughout the province fifteen Community Advisors (CAs) of the Department of Fisheries and Oceans (DFO) coordinated these releases as well as school and community hatchery projects, community habitat enhancement programs, and various educational programs. For more information on how you can help, check the list of Community Advisors and the B.C. map of the regions they represent, here.